Another fascinating day today, this time accompanied by blue skies and a friendly nip in the air. People don't seem to get into work until pretty late in the morning but I get the impression that they do stay late into the evening. I've been rising on the early side and was the first in by some time when I arrived a little before nine. I sorted out some odds and ends and reread a few of my thoughts from yesterday before having a great, long discussion with the professor I'm visiting here. A really good chat and it's good to be able to share my knowledge and exchange ideas in a really relaxed atmosphere. An early lunch in a canteen staffed by extremely jovial caterers was washed down with some rather nice coffee prior to the main event of the day. 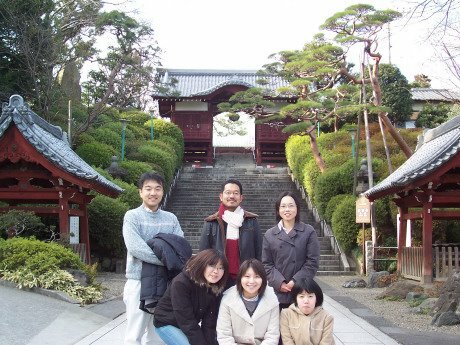 It was unplanned but since it was such a nice day, seven of us headed off to one of the nearby temples. Gokukuji is a rather fine example of a Buddhist temple though I'm still a little confused as to how this particular example intersects with the Shinto religion (at one time the State religion. The Wikipedia article is worth a read). 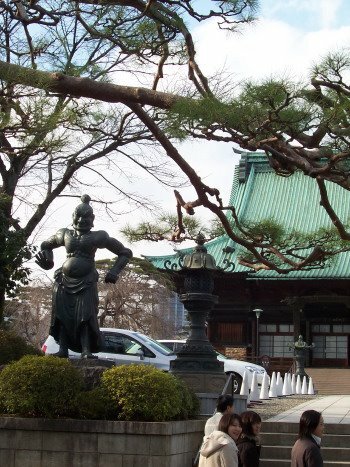 On the main gate are two burly looking guardians of the temple. This appears to be another, making sure that no ghosts sneak in. 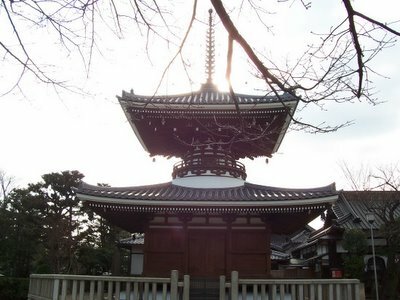 The temple was built around 250 years ago. The main temple looks to be from around that time but I think that some of the buildings are somewhat newer. I find the form and curves of this one hugely appealing. 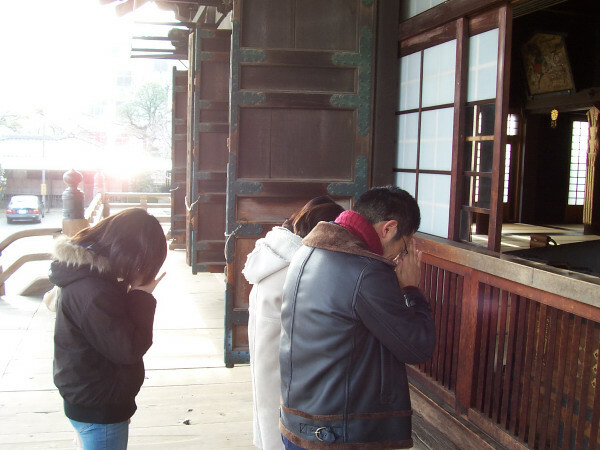 By throwing a coin into an offering box, people make wishes for their future. 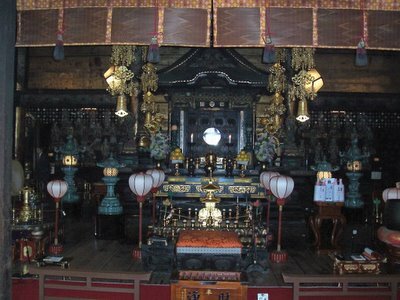 Shinto seems to be based on an emphasis of this life and not, like many forms of Buddhism on the next one. The animist spirits which are prayed to are, like the traditional Chinese Gods, representatives of earthly concepts and phenomena. Inside, the temple is lightly scented with incense and in front of a large prayer mat is an alter area where the Shinto priests perform the ceremonies. 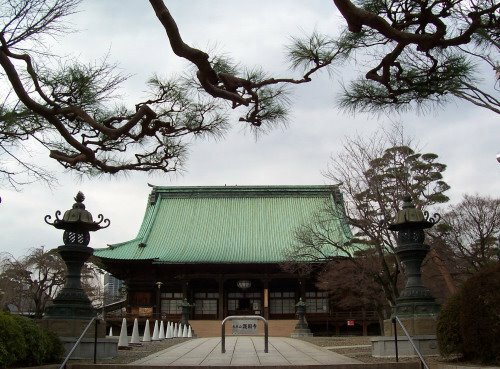 From the little I've read, this particular shrine has the honor of being the overseer of the Japanese tea ceremony which is practiced in all other temples. Some of the students picked up pieces of paper with their futures predicted on them. These are then tied to these bamboo branches were they will grow to fruition. On exiting the temple, we had this view of the main shrine framed with a traditional Japanese pine tree. On the walk back I commented that I'd seen many people reading comic books, in restaurants, on the train, in their cars and wanted to know a little more about them. 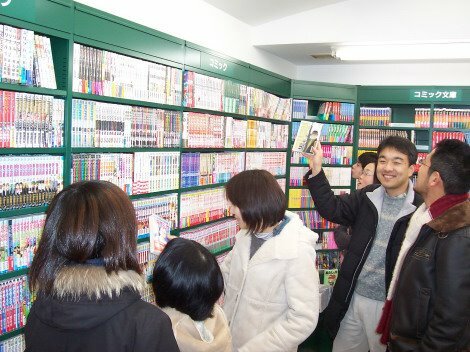 Some of the students were really into manga and it's amazing the number of different varieties and the length of time that some of them have been going for. I asked which was one of the most famous and am now a proud owner of Golgo 13 perfect machine of snipe, which I clearly can't understand but am interested to have a look through to see what so many people are completely absorbed by. Anyway, after a decent hour or so's excursion I headed back to the office to get my head down and try and work out how on Earth I can tackle the problem I'm faced with. I would say what I'm trying to do but someone might nab the idea (not that too many would be interested). Anyway, Chinese characters to be learning and my latest Steinbeck sitting patiently while I blabber on (Incidentally, if anyone knows why I can't seem to get hold of the full text of The Sea of Cortez including the reports of their findings, but only the log, I would be most interested to know). It seems that five papers have been written which took the bait on this one . Joke papers are published on the arxiv from time to time and this one is particularly amusing for those with a background in quantum field theory - a niche market in comedy perhaps but we can all laugh that much harder when we feel that we're in on an 'in joke'. 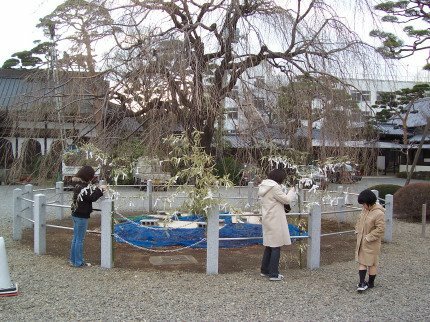 Glad you are loving Japan as much as we did. I have never felt so serenely happy and safe in all my life. The people are unreservedly kind and will go to extraordinary lengths out of their way to help you - but I'm sur eyou are finding all this out for yourself. I would love so much to live and work there, if only I also wasn't reduced to mutism due to my inability to pick up any language that isn't romanic. Make the most of your time there, I don't think there is anywhere else in the world like it. Lots of love Clare (and Alastair). It is a truly special and seemingly unique place and culture. I've lots of work to do but am going to try and see as much as possible while I'm here. Strangely, coming from China, the language to me sounds a lot more like Spanish or Italian than it does to other East Asian languages. I think I'll try and master my Mandarin before moving onto this but I think it sounds great. Your first sentence of this most recent post is very entertaining Biscuit. Is it a subtle joke, or was your particular choice of words accidental? Nope, entirely subconscious if anything. Thanks for pointing out my Freudian burblings. Chow Yun Fat, that famous Honk Kong action actor?